Made in Sydney, New South Wales, Australia, C.1910. Legendary soprano Dame Nellie Melba was born Helen Porter Mitchell in Melbourne in 1861. She began her stage career in Brussels in 1887 and triumphed two years later at London’s Covent Garden in ‘Romeo et Juliette’. From that date onwards, she appeared regularly at Covent Garden and the New York Metropolitan Opera, becoming one of the highest paid singers of the day. Full length empire line dress in fawn silk velvet and silk with velvet trim. Square neck edged with black velvet and cream silk. High waisted, slightly boned bodice meets skirt with a row of very rough stitching. Long skirt part of dress is finished with a strip of black velvet edged with cream silk. The skirt back is gathered onto the waist forming a short train. The long sleeves of the costume consist of bands of puffy cream silk (very tattered) and tight fawn velvet edged with black velvet. The sleeve ends with a curved cuff, and the long forearm section is tied at the back with criss-crossed black silk ribbon, which pulls together boned edges. Centre back opening fastens via two leather strips which hold a series of black enamelled hooks and eyes in place, threaded with a length of black ribbon. The bodice is lined with cream brushed cotton, the skirt with light brown cotton, and the cuffs with cream silk damask. 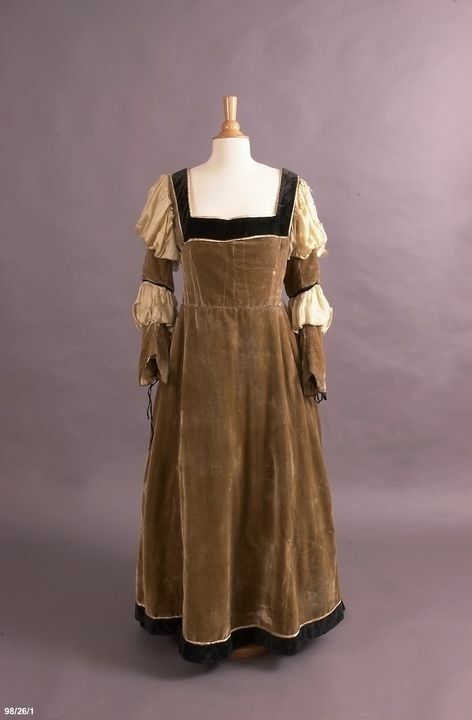 The velvet on the back is very worn, and the costume has been repaired in several places (mainly on the back). The register at the Sydney Opera House speculates that the "condition of this piece is character driven." The designer and maker are not known. Melba sang the part of Marguerite in 'Faust' from 1899 to c.1924 and the costume probably dates from c.1910. Dame Nellie Melba (1861-1931) was a legendary soprano. Born Helen Porter Mitchell in Melbourne, she began her stage career in Brussels in 1887 and triumphed two years later at London's Covent Garden in 'Romeo et Juliette'. From that day onwards she appeared regularly at Covent Garden and the New York Metropolitan Opera, becoming one of the highest paid singers of her day. Melba made her first appearance as Marguerite in 'Faust' at Covent Garden in 1899 and sang the part until her farewell season. She prepared for the part under the personal instruction of the composer Charles Gounod. It is thought that she wore this costume as Marguerite around 1910. Given to Barbara Firth by Hilda Mulligan, a retired director of the Sydney Conservatorium of Music, who had a collection of opera costumes. Donated by Barbara Firth to the Sydney Opera House around 1973. Transferred from the Dennis Wolanski Library, Sydney Opera House to the Powerhouse Museum in 1998.